As we age, different organs of the body also age in their own ways. Nothing stays the same and slowly starts to deteriorate. Sounds a bit gloomy but it doesn’t have to be. In order to maintain proper eye health, follow these steps and be stress free. A regular visit to the eye doctor even if you think everything is perfect, can help you quite a lot. Your eye doctor will be able to tell if there is something wrong or not even if you didn’t know about it. 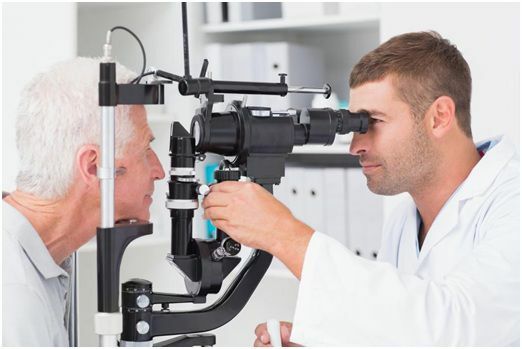 There are many eye diseases that elder people have a higher tendency of getting such as glaucoma, macular degeneration, cataracts, and retinal detachment. Many just ignore the early signs as something temporary and by the time they realize it could be something serious, it’s too late. • Look upwards, sideways and downwards without moving your head. Following a healthy diet is key to everything. Eat foods that are high in eye-health improving vitamins and minerals. Incorporate carrots in your diet because they contain high amounts of Vitamin A that is beneficial for eyesight. Eating lutien rich foods can vastly prevent and improve any retina damage. Lutien is a carotenoid vitamin, meaning it’s related to vitamin A and is a powerful fighter against macular degeneration and cataracts. So stock your fridge with leafy greens such as spinach, kale, and broccoli because they are abundant in Lutien. Start your morning with a glass of fresh orange or carrot juice and your eyes will love you for it. Always protect your eyes from any sun damage by wearing sun glasses. Glasses also help in protecting the eyes from any dust or particles getting in the eyes if you are outside. Never read for long hours or read in dim light. This puts a lot of stress on the eyes and affects their health. This also applies to looking at the screens of mobile phones or computers for long periods of time. Take a look at what we have to offer at Southern Comfort Family Services and feel free to contact us for quality healthcare for adults.